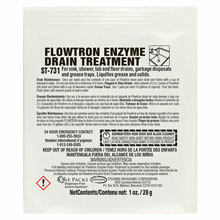 Effective powder enzyme treatments for maintaining or unclogging drains and grease traps. Perfect for institutional kitchens, restaurants, food processing plants, schools, and businesses. Non-toxic, non-caustic, and non-acid. Dissolves every form of concealed waste matter, and allows nature to purify the entire drain system.